Ed Miliband will set out radical plans on Monday to tackle low pay, announcing that a future Labour government would set a statutory minimum wage target linked to average hourly earnings. The proposals mark the first time Labour has suggested a long-term link between minimum wage and median earnings, rather than setting the figure in cash terms according to what the economy can afford year on year. Labour would attempt to reach the target over five years, and sees it as analogous to the government setting an inflation target for the Bank of England. Miliband will not announce the precise figure until before the general election. But a recent Resolution Foundation commission report on the minimum wage, chaired by Prof Sir George Bain, the first chairman of the Low Pay Commission (LPC), recommended a rate at 60% of average earnings as a "reasonable lodestar". That would put the UK minimum wage in the top third of developed countries. Miliband, speaking on Radio 4's Today, said: "This gets at a terrible scandal in this country of 5 million in low-paid work unable to make ends meet. We have got to tackle it and I just don't think we can carry on as we are. The minimum wage has done a good job in tackling the worst of exploitation but we have now got to tackle low pay." He refused to put a figure on minimum wage, or at what proportion of average earnings the target would be set, saying this was for a discussion with industry, but the aim "was to raise it as a proportion of average earnings from where it is now". In 2013 the minimum wage was set at 54.6% of average earnings, and the suggestion from the chancellor, George Osborne, that the minimum wage could be set at £7 an hour would take the wage to 57% of median earnings. Miliband will make his proposal to write "a new chapter" in the battle against low pay at the launch of his party's review of the minimum wage, undertaken by Alan Buckle, the former deputy chairman of KPMG International. Labour has tried to build its European election campaign around specific policy announcements such as better access to GPs, regulating the private rental sector in housing, improving social care, changes to zero-hours contracts and now low pay. 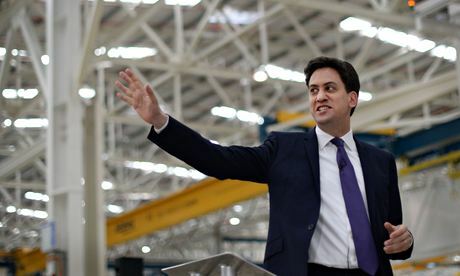 Miliband will claim at the launchsay: "It is time to raise our sights again because Britain can do better than this. The next Labour government will restore the link between hard work and building a decent life for your family. "A Labour government will establish a clear link between the level of the minimum wage and the scale of wages paid to other workers in our economy. We will say workers on the minimum wage must never be left behind because those who work hard to create our nation's wealth should share in it." Critics such as the Confederation of British Industry (CBI) warned that it has tolerated the minimum wage on the basis that it does not become a political football, and expressed concern about Miliband's proposals. "Business will be concerned with this sort of interference from a Labour government wanting to set a target," said Katja Hall, deputy director general of the CBI. "The minimum wage was introduced by a Labour government and it has widespread support from political parties and from employers. Let's not jeopardise that. Let's trust the Low Pay Commission to do their job." The CBI fears a five-year target or ambition linked to earnings would be unduly rigid, and possibly inflationary. But Miliband will stress the LPC would be free to take into account external shocks to the economic system. The business secretary, Vince Cable, has also proposed setting a long-term target for the minimum wage. Buckle proposes, in common with the Bain report, that the LPC, set up 15 years ago, should have broader terms of reference including a wider duty to tackle poverty and raise productivity across the UK. He will suggest joint employer-employee taskforces to examine the causes of low productivity and low pay in specific sectors such as catering or social care. That in turn could lead to different minimum earnings targets in different sectors. There is no single body in the UK responsible for examining the sources of low productivity, although Acas, the conciliation service, is broadly responsible for good industrial relations. Buckle has found the number of workers on low pay – defined as those paid less than the living wage of £7.45 per hour outside London and £8.80 in the capital – now stands at 5.2 million – one in five of all workers and one in three of women in work. That figure is up from 4.8 million in 2012 and 3.4 million in 2009. He has estimated the cost to government finances in tax credits and lost taxable income is close to £3.23bn. Buckle also suggests that poor enforcement in some sectors means that more than a quarter of a million people are still estimated to earn less than the national minimum wage, while the UK has higher levels of low pay and lower levels of productivity than many international competitors. Buckle also stresses that this long-term earnings target cannot be pursued regardless of the state of the economy, and external shocks must be taken into account. The Buckle report also makes some more familiar recommendations, including strengthening enforcement of the minimum wage by extending the remit of HMRC to take action against those employers who fail to pay workers for holidays. It also suggest employers could be encouraged to pay the higher living wage by making it a condition of large central government contracts, requiring employers to disclose numbers earning less than the rate, and offering temporary incentives to raise low pay. Despite the emphasis on reform, the Buckle report stresses the minimum wage is a rare policy which enjoys widespread support, increasingly cross-party. The annual process through which it is set, drawing on a rigorous evidence base and agreed by a panel with representatives from employers, unions and academia, would be retained. Buckle said: "The current system was designed in the 1990s to stop extreme low pay and abuse. But, with millions of people earning just above the minimum still living in poverty, we need a broader and more ambitious strategy to tackle low pay and move to a more high-skill, high-wage economy. Businesses have choices about how to compete, and policymakers should seek to create incentives to encourage more productive, higher value business models. "I believe that my core proposal of a clear goal to increase the minimum wage over the life of a parliament is achievable as part of a national mission to tackle the problem of low pay, and that achieving this will be good for citizens, business and the government."